Life is too short for bad food and bad beverages. I like to write about what I love. ASAE’s 2012 Annual Meeting had many amazing things. Thought provoking sessions, controversial speakers, an expo that included a carousel, an amazing opening session… and food. So while more thoughtful posts are marinating, this is a good opportunity to share perhaps the tastiest takeaway I got from this year’s annual meeting. You see, I love to grill and barbecue. So as I walked past the Visit Dallas booth (aka @visit_dallas), my taste buds did a double take as I saw they were handing out a Texas Barbecue rub. I couldn’t resist. The recipe is below, and I hope you your brisket turns out as great as mine. More important, be sure to share. And when you dig in… think of Dallas and the 2012 ASAE Annual meeting. I did for sure. One bag of hickory smoking chips (also a good idea to have a smoking box but you can use aluminum foil if you have to). Aluminum foil pan about the size of the brisket (to put under your brisket when cooking). One 7 – 8 pound beef brisket. Be sure to get at least USDA choice graded meat. If you can find it vacuum packed that’s even better. The night before, make sure to prepare the brisket and get it ready for a day of slow cooking. Trim the fat cap on top the brisket so it is about ¼ inch thick. Place the brisket in a deep dish or on a cookie sheet with a raised edge. Prepare the seasoning paste mixing together the ingredients. It should have the consistency of slightly runny pancake batter. Add a smidge more liquid if you need to. Prepare several sheets of cling-wrap to completely wrap up your brisket. I cut 4 sheet long sheets of wrap and put them on the counter setting them up so I can fold them over the brisket both lengthwise and across. Transfer the brisket to the cling wrap. 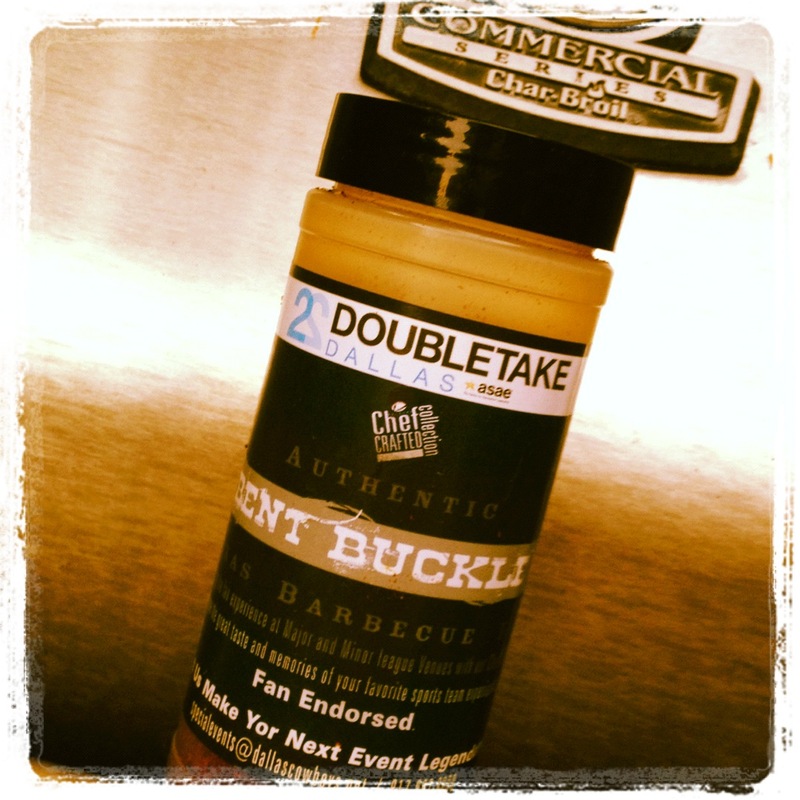 Generously cover your brisket on both sides with the Bent Buckle Texas Barbecue Rub rub. I ended up using about 1/3bottle of rub. Wrap the brisket tightly in the cling wrap and place in the refrigerator over night. The next morning, you are ready to start cooking. Yes, you read right. MORNING. Start early – around 8 AM – by setting your grill for indirect cooking and getting things ready. Soak about a handful of smoking chips for 15 minutes. Get your grill going on high. Place the smoking chips in a smoking box or make a foil pouch for your chips. If making a foil pouch, put a hole in them. If you are lazy (like me), just put the chips on a piece of aluminum foil and crunch it up so it looks like a garlic bulb, leaving about an inch opening at the top. Let the chips start to warm up until they are smoking. Now it is time to get the meat going. Turn the heat back on and keep the flame low. Unwrap the brisket and place it fatty side up on the cooking grate. Check the temperature two or three times an hour to make sure it doesn’t get too high. When you do so, go ahead and baste it with your mop sauce. Every now and then, add more smoking chips (I generally do not soak these chips as I did the first batch). To get the chips smoking you might want to turn the heat up higher (to around 350 to 400 degrees). But keep the grill open so the temperature of the meat doesn’t get too high. Once the chips start smoking, turn the heat back down and close the grill. After about 4 hours – or when the temperature has hit around 150 degrees, it’s time to switch gears and finish your brisket in the oven with a process called The Texas Crutch. Baste the brisket in your favorite barbecue sauce and place on several sheets of aluminum foil with the fat side up. Baste one more time with your mop sauce, and wrap the brisket tightly in the aluminum foil. Place it either in a baking dish or on a cookie sheet with a raised edge and put it into the oven at 225 degrees. Let it finish in the oven for the next 4 ½ hours or until the meat gets to 190 degrees. When you check the temperature, feel free to drain off some of the juices (save it) and either baste the meat in the juices or a bit more mop sauce. Once the meat hits the right temperature, unwrap the brisket, place it on a serving platter, cover with aluminum foil and let rest for at least 30 minutes. Now you are ready to serve. Thinly slice the meat across the grain and serve. Put out the juices you drained off and/or a bit of barbecue sauce. For some other serving suggestions, it goes great with my favorite Baked Potato Salad from Wegmans and corn on the cob (cooked on the grill is even better). Some people like to serve it on a bun and make a sandwich, but it’s also wonderful just by itself. So there you go. My tastiest takeaway from ASAE’s 2012 Annual Meeting. Yes, everything in Texas was bigger. And the Authentic Bent Buckle Texas Barbecue Rub courtesy of the Visit Dallas team made sure a bit of the meeting made it home to my family and friends. I picked up some Brawler Ale from Yards Brewing Company in Philadelphia over the weekend and opened my first bottle the other night. I was quite impressed by the malt flavor and overall color and experience of the beer. It presented well, very balanced and was real enjoyable…. and yet I kept feeling like something just wasn’t quite right. As I prepared dinner this evening my wife was enjoying a Brawler and commented how much she liked it. So I reached in and grabbed another. As I opened it I actually bothered to read the label this time (yes, like most men I don’t always RTFM) and then I realized why it had struck me as odd. Don’t get me wrong, I really like this beer. Good flavor and enjoyable to drink as I sit here writing this post and watching a hockey game. I think just in knowing that it is a session beer made a difference and makes it a complete beer experience. Lesson learned? Read the full label and know what I’m buying and drinking. Also, not every enjoyable beer has to be super hopped or high alcohol. Durango is a small town with a huge personality. Surrounded by beautiful mountains with a vibrant river flowing through it, Durango conveys a bold attitude and fresh perspective that this mid-Atlantic suburbanite finds intoxicating (everytime we visit, I long to quit my job and just move). So you can imagine the expectations that go with a beer bearing this town’s name. Sure enough, the fine brews from the Durango Brewing Company live up to the spirit of Durango. I had the pleasure sampling two wonderful Durango Brewing Company brews during my trip — the Durango Amber Ale and the Durango Wheat Beer. According to the company’s Web site, the Amber Ale as a “deep amber color, medium body, and mild hop bitterness making it a well balanced refreshing beer.” Personally, I found the Amber Ale to be better tasting than most ambers, but compared to the the other fine ambers I’ve sampled lately it didn’t really stand out above the rest. Definately worth tasting again but nothing to warrant another trip across the country. As for the Wheat Beer, I DID find it unique enough that it stood out. To many people when you say “Wheat Beer” they think “Hefeweizen” in the German tradition. But as I learned at a recent evening at DC’s Churchkey, the “Wheat Beer” label goes way beyond that pale expectation. And Durango’s Wheat Beer follows this tradition with it’s “American-Style Wheat with domestic barley and wheat malts.” In just looking at the beer it has the same appearance as a standard smooth flowing lager. But upon putting it to your lips you realize that it not only combines a good drinkability with additional flavor and personality. The combination just makes it memorable. Apparently this beer is a 2007 Colorado State Fair winner — and I can see why. If I could have brought some home, I would have snuck it into my luggage. My one regret with this brewery is that I couldn’t spend any time at their facility. We stopped in the restuarant/bar for dinner and it looked like a fun place with a focus on good beer. Tables are set up for socializing and drinking with not much emphasis on food (although they do serve food). The environment just begged for a session beer and spending time with friends and enjoyable brews. Alas, as I was with my family and mother-in-law this was not quite the environment suitable for a family dinner. However, as a beer drinker I longed to escape from our hotel and venture back to sip a few brews. On our next trip, this place is definitely on my to-do list. Today’s entry on my beer journey while on my trip to Durango, Colorado is a video-blog entry. Cheers! It’s been a long long travel day. Our flight from BWI was delayed by 2+ hours even after we got to the airport mongo early to account for 5 people checking and security. So there went my plan for a leisurely repaste in the haven of Dallas-Ft Worth airport. offered up an excellent recommendation for local food and brew. 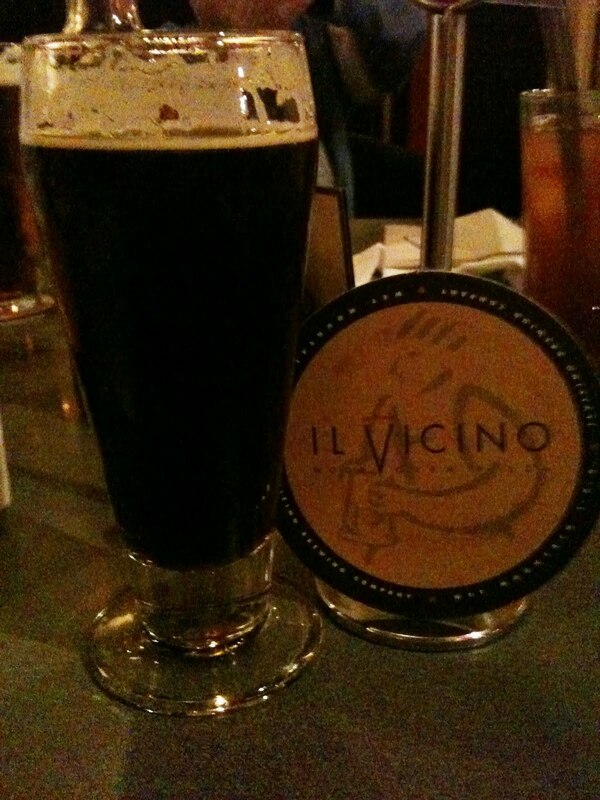 So with everyone checked into the hotel and the rental vehicle loaded up we ventured out to Il Vicino — known for their wonderful flatbreads pizzas and microbrews. Oooo. Yeahhhhh!! Great choice. The menu had a great selection of pizzas which took us a good 8 to 10 minutes to order. The beer list was shorter and was an easier decision. My wife had ordered the Rob’s Amber and didn’t enjoy it. Being the chivalrous dude that I am…. I switched with her. And what a good call that was! At first sip I could see why she didn’t like it. The glass was filled with what looked like a standard amber ale, but the taste buds revealed a hoppy flavor that really took this beer someplace special. It really provided for a complex experience that was like finding a hidden surprise (much like when you find an extra 5 bucks in your jeans, but tastier). My only regret is that I could have only one. Oh well, this gives me another reason to come back some time. First stop on this sipping sojourn is a hotel in Baltimore before we fly out of BWI in the morning. Considering our schedule we (wisely) decided to just have dinner at the hotel. But alas where my heart had already been planning for a Clipper City or Natty Boh there was no local beer to be had. However amid the bland choices of watered down Miller or Bud there emerged an interesting choice…. Shiner Bock. Now truth be told this was my ace in the hole for tomorrow as our flight has a layover in Dallas and I had already planned this one out. But in light of the situation I had to act. And Shiner never disappoints. When trying to step away from the ordinary, she has a way of popping up and saying “there’s a better choice”. Tonite was no exception. Paired with a buffalo chicken sandwich it was a perfect way to start the journey. What’s interesting is that this is the one Shiner brew that seems to have escaped the great state of Texas. What’s up with the other fine Shiner brews? The web site mentions a blonde ale. That should surely be worthy of export. But the faithful Bock is the only one that people outside of Texas seem to able to sip. I’ll have to investigate further. Of course now the quandry that faces me is…. What’s waiting for me in Texas tomorrow? It’s a worthy challenge.